The original flex rails are only available in 2 sizes. 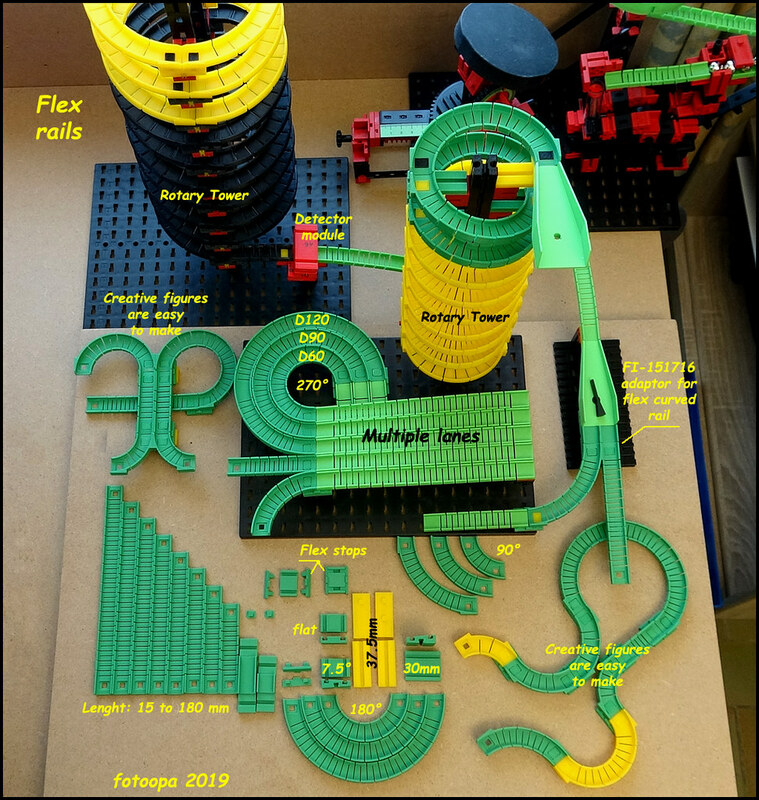 By making multiple lengths via 3D printing you have a lot of possibilities for building the ball track. Bending the original flex rails is not always easy. That's why I made several circular versions here. They are available in 90, 180 and 270 degrees. The diameters are 60, 90 and 120mm. They are not intended to bend further to another diameter although it remains possible. You can place the 60, 90 and 120mm nicely in a circle which makes a nice track possible. I have also designed a number of new blocks to make it easier to use the flex rails. There's also a side-left stop plate that allows you to better align the rails and keep them in place. A block has been made with a 7.5° inclination according to the normal angle at which the balls run. This replaces an FT-38428 and an FT-32071 block. Another new block is a 37.5mm version of the FT-35079 but equipped with 2 pins. This makes the block more secure. It is also made with 1 pin as an alternative. The circular flex rails have a different height for the inside and outside edge. The inside has the same value as the original FT rail, 4mm but the outside edge has 6mm. This allows a higher speed in the curve without the balls flying out. Several small details on the flex rails make it stronger to use. Small roundings are used and the thickness of the base is slightly increased. The end of the rail is then slightly chamfered so that they are at the same height as the original rails. I use a rectangular inlay profile for the pins. This is done to better adapt printing deviations. Now you know how they are on the printboard. All parts are tested and optimized for the Fashforge Finder 3D printer so no finishing is needed. All flex rails are printed with 100% fill. I use PolyMaker polymax PLA because it is much stronger ( 9x ) than the regular PLA. The temperature is 210 degrees, no Brim, no Wall, print speed 60mm/s, Travel speed 80mm/s, Layer Height 0.18mm, First Layer Height 0.25mm. To avoid distortion I use Pelikan Pelifix glue pen to lubricate the 3D print plate. Because the Finder does not have a heated table, I heat the plate by keeping it under flowing hot water. The temperature is around 40-50 degrees at the start of the printing and you have a perfete 3D print. Stupid question: If these aren't supposed to be bent. Why didn't you make them solid? Wouldn't that make them more robust and easier to print? They still need to be able to bend because they need to be adjusted in height. The slope can be adjusted this way. It's only yesterday I found myself thinking that we hadn't heard from Frans in a while. Now I know why! Could it be there is a tiny error in this straight rail? It seems maybe you forgot to chamfer one of the edges. Yes you are right, one has been forgotten! I'm going to see for an update. Those chamfers are mainly to prevent the outside from folding too much. I changed the file and uploaded it again. Absolutely fantastic, this will keep my printer busy for weeks, thank you, Frans! This looks very professional. Excellent work! PHabermehl hat geschrieben: Absolutely fantastic, this will keep my printer busy for weeks, thank you, Frans! reus hat geschrieben: This looks very professional. Excellent work! Thanks everyone. I have printed many hours of 3D printing, more than 150, for all the tests. Many details have been worked out, many chamfers have been optimized. Meanwhile, again, several new parts are now printing. They are now being tested. There are again some nice applications. Within a few days they will also be online again.